Bodygaurd T240P offers you a faster and more accurate contact heart rate readouts shaped in a natural hand resting position. It is driven by a 2.75 HP DC motor, whose maximum speed limit is 11 mph. All the benefits of a heavy-duty platform frame in a space efficient footprint. Loaded with motivating programs, Heart Rate Control and workout feedback the T240P is a great upgrade if you are looking to maximize training results. ToughTrain 3.5 out of 5 Modified version T240C. Can be a worth buy. 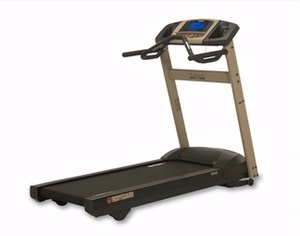 Treadmill-Reviews.com 2.9 out of 5 The T240P is a nice unit and it represents a great compromise of price for performance within the Bodyguard lineup. *Note: Most of the sites, stores or shopping portals listed above sell Bodyguard T240P Residential Treadmill with discounts and other exciting offers. There is a possibility that the some of above websites are not selling Bodyguard T240P Residential Treadmill now. Toughtrain.com is not liable for such cases or instances. Also we do not recommend any seller for Bodyguard T240P Residential Treadmill and a buyer should buy from where he/she gets best deal with quality of products, service and on time delivery (shipment).